Since obtaining her WSET Diploma in 1996, Carol has been tasting, talking, teaching and writing about wine in Aberdeen and around Scotland and is known for her informal, infectious, enthusiastic style. With a background in hospitality management, Carol understands the needs of both the trade and consumer when it comes to wine education. Carol is an Approved Programme Provider and tutor for the WSET. She also offers Wine Education Service courses and Workshops as well as corporate entertainment wine tastings. 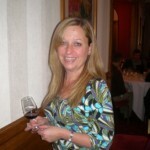 Carol can act as your host for gourmet wine dinners and enjoys the challenges presented when food and wine combining. Carol founded the Aberdeen Wine Appreciators Tasting group in 1999 and tastings are held around 10 times a year and in April 2017, she launched the popular Aberdeen Gin Appreciators tasting group. A freelance wine writer, Carol currently has a regular wine column in the Press and Journal and has previously written for Aberdeen based Savour the North East, Gazette and Trend magazine and Inverness based Highland Life. Carol has travelled around many wine regions of the world and has visited France, Spain, Portugal, Madeira, Italy, Slovenia, Germany, Austria, Hungary, Switzerland, Lebanon, South Africa, California and Chile and does think that she probably has the best job in the world. She is a judge for the International Wine and Spirits Competition and in 2006, she was a UK finalist in the European Champagne Ambassador Awards. Carol is also a certified Sherry Educator and a Certified Rioja Wine Educator. She is also an Associate Member of the Institute of Wines and Spirits.